Home » Archive by category "Green Economics"
Sererra Consulting Group, LLC., a leading Green IT technology and management consulting firm focusing on delivering turnkey business solutions for midmarket firms worldwide, today announced the availability of its Facebook Webstore SuiteApp for NetSuite SuiteCommerce. Built using NetSuite’s SuiteCloud computing platform, the SuiteApp is a new addition to SuiteCommerce, the new NetSuite commerce-aware cloud platform that enables businesses to manage B2B and B2C transactions regardless of touchpoint (website, smartphone, tablet, social media). The Facebook Webstore SuiteApp allows merchants to quickly, easily and cost-effectively sell more products or services by creating a shopping tab on their Facebook page. It also allows retailers to more easily monetize Facebook as a sales channel, backed by the power of the NetSuite cloud. Sererra’s Facebook Webstore SuiteApp establishes a Facebook store as an additional sales channel, fully integrated with NetSuite. The SuiteApp leverages existing NetSuite functionality and data, including catalog products, checkout processes and customer information, without taking customers away from the Facebook interface. Visit http://www.suiteapp.com for more information about NetSuite applications. The SuiteCloud Developer Network (SDN) is a comprehensive developer program for Independent Software Vendors (ISVs) who build apps for SuiteCloud. Visit http://www.suiteapp.com for more information about third-party solutions for NetSuite, a single-source online marketplace where NetSuite customers can find applications to meet specific business process or industry-specific needs. For more information on SuiteCloud and the SDN program, please visit http://www.netsuite.com/developers. About Sererra Consulting Group, LLC. Sererra Consulting Group, LLC. is a leader in business process and technology management offering a broad portfolio of the best Green IT cloud-based ERP, CRM and eCommerce solutions to the mid-market. Focused on process engineering, implementation, integrations and application development, coupled with deep knowledge of IT capabilities, Sererra has partnered with NetSuite to give a comprehensive client solution. With hundreds of implementations, Sererra provides customers with a complete unified integrated solution that enables our client’s business to grow more profitably. Connect with Sererra on our TechCloud | Green IT Cloud Computing blog. NOTE: NetSuite, the NetSuite logo and SuiteCommerce are service marks of NetSuite Inc. The Michigan Municipal League represents Michigan’s cities and villages and is constantly visiting them. Here are some photos of the League’s recent visits to Petoskey in Northern Michigan. 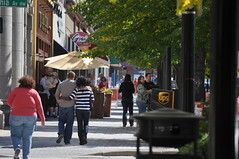 Petoskey is very nice community with a mix of shops, restaurants and stores nestled near Little Traverse Bay off Lake Michigan. It’s also very close to the vacation resort Boyne Highlands known for its zip lines, outdoor recreation and Young Americans troupe. 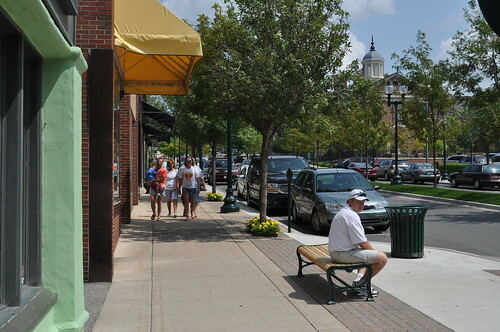 Downtown Petoskey has many of the placemaking assets the League has identified as making up vibrant communities, including green space, walking trails, public benches, outdoor dining and much more. For more about placemaking go to the League’s website mml.org and visit the page about our Center for 21st Century Communities: www.mml.org/resources/21c3/about.html. You can also visit a placemaking blog by League CEO Dan Gilmartin called www.economicsofplace.com/ and our new placemaking page at mml.org/placemaking. 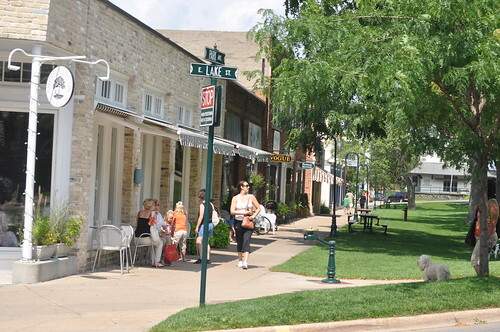 In addition, the League’s 2012 Convention taking place in October on Mackinac Island will focus on how Michigan communities of all shapes and sizes can implement placemaking assets. It’s easier than you may think. For details on the 2012 Tools of Placemaking Convention go to convention.mml.org (www.mml.org/events/annual_convention/). (Financial Press) – Canada-based exploration company Alix Resources is targeting a major gold discovery adjacent to one of Alaska’s most successful gold mines. This early-stage company has established a number of high-potential gold prospects across its large project. The property, which includes both the Money Rock and West Pogo gold exploration properties, is located immediately next to the Pogo Gold Mine. This mine is owned and operated by Japanese conglomerate Sumitomo Metal Mining Co. and Sumitomo Corp. It produces around 400,000 ounces of gold per year. And is one of few high-grade gold mines to be put into production in the past few years. Furthermore, the gold production statistics of the mine show it is very high and economical grades of gold. The Pogo Mine’s reserves are 12.3 million tonnes with an average grade of 0.366 ounces per tonne (equivalent to 10.376 g/t gold). That’s many times higher than many of the new mines which are currently producing and the new ones being opened up. Sumitomo is also actively exploring around the Pogo Mine project as well. In short, professional geologies believe there’s a lot of potential gold in this region. And the potential rewards are so high of making a significant discovery in this area, they’re going to take the time and spend the money to do it. This is where Alix comes in. Alix’s Money Rock/West Pogo gold exploration project is immediately adjacent to the Pogo Mine. The first map shows Alix’s Money Rock and Pogo West properties (green) relative to the Pogo Mine and Sumitomo’s other properties which it’s also exploring in this region of Alaska. Alix’s position in the region is a very strong one. Its projects are more than just close to the Pogo Mine though. They also contain a number of extremely high-grade gold showings. Extensive surface sampling has revealed prospective gold throughout a large portion of the 5,439 hectares of gold exploration territory Alix has acquired and developed. The results from the surface sampling have produced some stellar results. The highest grade sample from the West Pogo properties included a staggering 118.5 g/t gold sample. And the highest grade samples from the Money Rock property graded as high as 200 g/t gold. The second map shows where Alix’s surface sampling efforts have returned gold showings throughout most of the portions of the property it has tested. Alix has made all the right moves so far in its efforts to build a potentially lucrative and valuable gold discovery in a region where many significant gold deposits have been discovered. The company has aggressively completed much of the surface work which doesn’t garner much attention from the markets, but is essential to building geological models of the area and identifying the most prospective drilling targets on the extensive property. Today Alix announced it’s moving into the final stages of exploration where the potential of the Money Rock/West Pogo project can be confirmed to the market. The company has started drilling. Alix has announced it has begun a 6,000 foot drill program encompassing targeting the multiple high-grade gold zones surface geologic testing and research revealed may exist on the property. Alix has targeted the highest potential within the Money Rock/West Pogo project complex. In addition to the drilling, the company plans to continue its geologic mapping and will still be sampling silt, soil, and the anomalous rock formations in the area to get an even more developed understanding of the geology in the region. Alix has been rapidly completing all of the non-drilling exploration activities in preparation for the current summer drill season in this region in Alaska. And now that the essential early stages of geological reconnaissance are complete, the company can drill and determine how much potential is really contained in the Money Rock/West Pogo project. Alix Resources trades on the TSX Venture Exchange under the ticker symbol “AIX.” It also trades in Frankfurt on the Deutsche Borse under the symbol “37N.” It has a current market capitalization of approximately $ 2.5 million. Learn more about the company at http://www.alixresources.com. Elemental Essentialz is pleased to announce its response to two major problems with a majority of household cleaners: dangerous chemicals and packaging waste. Their innovative approach to packaging will save resources and minimize waste, while investing in the health of future generations. Using wine bottles and letting customers refill them, will minimize the need for single use packaging, decrease total energy consumption and will virtually eliminate packaging waste. Customers will appreciate, that in addition to being good for the planet, refilling will also be economical. The refill price will be just over 1/2 the cost of the initial bottle. Elemental Essentialz products contain no petroleum products, dyes, chlorine, animal products or phosphates. They are non-toxic and never animal tested. Currently, Essentialz’ products include their All Purpose Cleaner, Glass & Granite Cleaner and Soft Scrubbing Cleaner. They have just recently added a line of coconut milk soaps, shea butter lotions and lip balms; all of which are handmade in McKinney using essential oils and natural ingredients. Harris’ unique packaging idea came to her, while sitting in a restaurant. As she watched glass bottles go from table to trash, her decision was made. She contacted local restaurants and wineries and started collecting the majority of her bottles from two local businesses, Landon Winery and ZinZen Wine Bistro. Harris was then introduced to Green Earth Soda Blasting, another innovative and green company located in McKinney, to remove the labels. “Green Earth SB was a life saver. They took care of our bottles in 1/10th the amount of time it took us,” Harris said. Very quickly, Essentialz outgrew the kitchen where it all started and currently manufactures out of Terrell, TX. This Saturday, June 2nd, Elemental Essentialz will be at Fresh for their Taste of TEXAS and 2nd Annual Steak Cook-Off, which supports the East Texas Food Bank. Elemental Essentialz creates household cleaning products that are safer for customers and better for the planet by eliminating dangerous chemicals and minimizing packaging waste. It is a new company revisiting an older way of doing business. With their line of natural products and unique solution to packaging, Elemental Essentialz is realizing their mission: to improve health and waste nothing. In addition to being available for purchase online or at Fresh, Elemental Essentialz will be available soon at all 9 Central Markets in TX. For information regarding new retail locations, projected dates, and upcoming markets at McKinney’s Chestnut Square and Deep Ellum, visit their website or contact the company via email. Slavoj Zizek, one of the worlds most influential living philosophers, visits the RSA to discuss capitalism’s flawed priorities. Is Barack Hussein Obama a socialist? Do you judge a man by the company he keeps? Question by : Is Barack Hussein Obama a socialist? Do you judge a man by the company he keeps? yes he is a socialist. He is making the rich pay more than the poor. He doesn’t have common sense and is probably the dumbest president ever. Would these methods help reduce poverty in the US? Question by Voyageur: Would these methods help reduce poverty in the US? Please read them all. I know it’s a lot. Would these methods help reduce poverty in the US? Why or why not? 1. Start teaching economics in 5th grade in high poverty/working class schools. 2. Make sure schools spend the $ on students not superfluous things such as giant pools, extended parking lots, new administration buildings (while school itself is in horrible condition), private jets for superintendents, and staff meetings in Orlando in luxurious hotels. 3. Make sure all high poverty schools have at least 2 counselors. 4. Crack down on drug addicts in the middle-upper class suburbs. Majority of meth, crack, and heroin users are middle-upper class Whites, but instead of prisons focus on counseling. 5. Spend more money on education for the poor than on prisons. More $ means less dropouts, and less drug dealers. It really isn’t about more $ actually, but re-designing the school system, using the $ already there in a better way. 6. Copy Finland’s policy. Any student who does not go to college or military is mandated to do 2 years of trade school. They can do 2 years of electrical work or 1 yr. of beauty school, 1 yr. of electrical work, etc. In Finland this has created an extremely low unemployment rate, an almost non-existent crime rate, and plenty of plumbers, electricians, carpenters, etc. who can support a family. 7. Crack down on unequal housing. Real estate companies who charge Black and Hispanic families more for a house than Whites. 8. Give cities grants to knock down abandoned buildings/homes and place in green areas, gardens, playgrounds, etc. Up to community to upkeep the grounds. 9. Teach in all schools about environmentalism and how to save energy (saves $ ). 10. Crack down on loan sharks. 11. Start paying back African-Americans reparations. Let the Black community decide how to use the money. 12. Start paying back women reparations, more going to Black women as they are paid the least in unequal pay. Since 1984-2005 due to unequal pay women are owed $ 300 billion dollars. 13. Sign the 1923 Equal Employment act and crack down on businesses who give unequal pay to women. 14. Start paying more attention to rural poverty. 11. Stuff didn’t end in 1965 my friend. Interesting reply to #12. Yes, perhaps we need to crack down on the businesses not make the avg. Joe suffer for it. Good call! I forgot to mention any reparations would not be payed by tax payers. Also, the US govt has given reparations to Asian Americans and Native Americans. Why not African Americans and Women? true Rabbi, and well said. As for reparations to Blacks I didn’t just mean slavery but the lynching and Jim Crow era as well, and the corrupt police who introduced cocaine in the 1970s into Black neighborhoods to pay for the Nicaraguan arms trade. But anyway, what you said, you’re absolutely right. Meagan: No worries, and I respect your opinion. The thing is how easy is it for us women to “get over it” if we are 300 billion dollars behind, then we will always remain behind. But like a good chap said in another forum, capitalism is all about high output with little input- aka paying ppl peanuts to get the work done, hence why companies have taken their business to China and India to pay people pennies for work. Nata: Yes, sadly many people abuse the system, and others who wouldn’t can’t even get their names on the list. 6. It is a person’s choice on what to do, no one should force anyone to do other then what they want. 9. Many times this costs more money in the end. 11. & 12. I do not get what you mean by this. Pay back reparations for what? For what happened during the 60’s and before? While I believe what happened during this time was wrong, I do not want my tax money going toward any one group, for things that happened 40+ years ago. I was not alive during the 60’s and before, therefore I am not in any way responsible for that, and I will not pay for what I did not do. I am not racist, but this policy seems racist. As far as number 12, and women in general, again does not make sense, because I am not the employer whom made this decision, so I do not want my tax dollars going towards something that I am again not responsible for. While some of these are good enough ideas, especially with educating (although we need to totally redo our education system) I believe this issue is far more complex, and will take more action, and different means of action.